What happens when you combine a skateboard, a bucket, two tennis balls and a balloon? 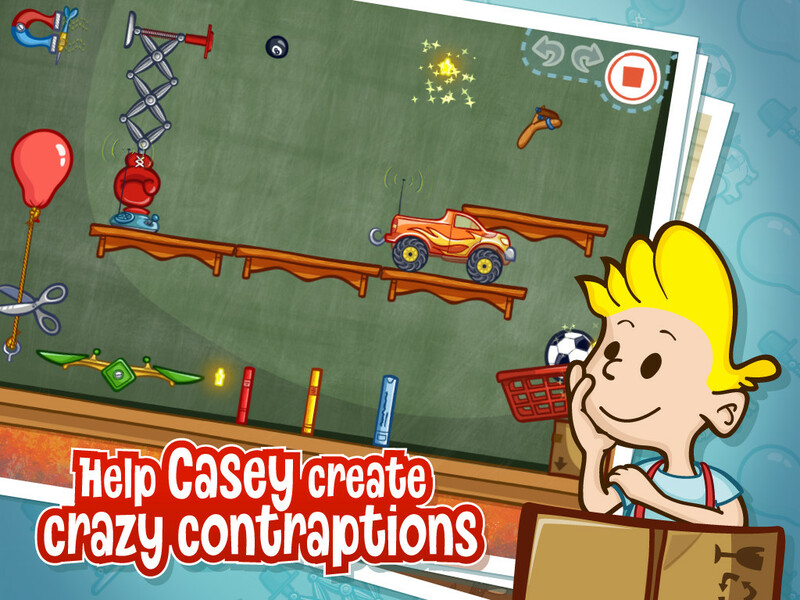 If Casey’s Contraptions [$2.99] is any indication, you make a surprisingly deep physics puzzler. Of course, a lot more than that went into this first team up by Snappy Touch and Mystery Coconut Games. 30 different items introduced over 72 levels, a level editor and a creative solution sharing mechanic are all part of what makes Casey’s Contraptions so much fun. But to get the most out of it, you’ll need to bring something more to the table as well – a child-like desire to play and experiment. 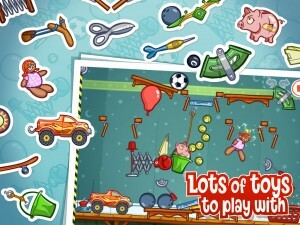 Not because this game is childish or easy – it’s just presented through a child’s point of view. Eight-year-old Casey guides you through each level, and it’s his toys you’ll be playing with. You’ll need to build contraptions out of these toys, like magnets, slingshots and darts, to help him through play time and chores. Things start out simple and get more and more complicated as you progress. If you’re willing to experiment, you’ll have a ton of fun. If you just want to get through each level as quickly as possible, however, you won’t be nearly as well rewarded. Nearly every level in Casey’s Contraptions can be solved in many different ways. There is no “right" way, although you’ll probably want to collect all three stars each time. Other than that, you’re welcome to use the toolbox presented to you in each level however you want, as long as it gets you to that level’s goal. If you come up with a solution you think is cool, you can share it with your Game Center friends with a single click. You can also see your friends’ published solutions, including Casey’s three-star solution. If you want to check them out mid-level, you can. This keeps things from becoming too frustrating if you just can’t find a workable answer, but I’d recommend you keep yourself from peeking when you can avoid it. Trying to copy a solution turns Casey’s Contraptions from a game of experimentation into a frustrating game of pixel hunting as you try to find someone’s precise positioning. It’s much more fun to do it yourself and then check out all the crazy solutions your friends found. You shouldn’t get completely stuck, anyways, since the game only requires you to complete three out of every four levels to progress. Technically and visually, Casey’s Contraptions is superb. Though the physics are a bit cartoony, things always behave how you’d expect them to once you see them in action. If you drop a ball onto a spring and it bounces a quarter-inch away from your goal, moving the ball and spring that quarter inch will work every time. This is super important, because in later levels you’ll be pulling out a lot of trial-and-error solutions. “But what if I did this?" was a common refrain while I played. As you progress through the game, you unlock the items you work with for use in the game’s level editor. I haven’t had a chance to play with many friends yet, but I can’t wait to create some crazy contraptions for people to solve. In a particularly smart touch, you’re required to solve each level you create with all three stars before you can send it out. My only disappointment is that you can’t share your creations with the world at large – just with your Game Center friends. A rating system and some public curation would be a fantastic addition to Casey’s Contraptions. A few achievements wouldn’t hurt, either. It sounds like there are a lot more levels in the works, and an iPhone release coming down the road. The developers are taking feedback in their thread on our forums, so let them know what you think. And just to head off one question I know is coming: I don’t know exactly how similar it is to The Incredible Machine, and its various sequels, because I missed out on those PC classics as a kid. 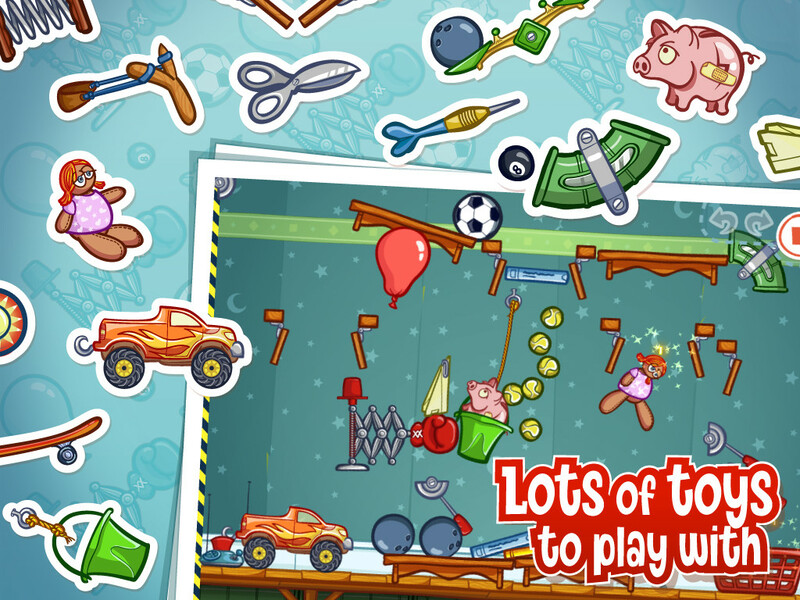 Coming into it fresh, though, I can tell you this – Casey’s Contraptions is a joy to play.